← “Pretty Good for Being Self-Published”—Insult? Marketing fiction books and especially blogging are quite a challenge. Nonfiction authors have an advantage: They can attract the target audience with free content, seminars, etc. Very often, a nonfiction book has information that people need or will find helpful. A novel, on the other hand, may primarily serve to entertain. There are very many hot selling fiction books, but it takes a book that is highly marketable from cover to cover and, with rare exceptions, required effective marketing. Fiction authors who take up marketing start a blog as one part of their marketing strategy, but often struggle with how to attract the target audience. Much thought, time, and effort can be put into a short story that scarcely gets read. Blogs grow very slowly, and most posts don’t receive much attention until a blog has really blossomed. Most blog readers aren’t particularly looking for short stories, especially from unknown authors. And even if they are, there are many different kinds of short stories, most of which won’t appeal to a given reader. In some cases, it might be harder to get readers for free short stories on blogs than it is to sell a short story on Amazon (and that’s a challenge, too). It’s hard to attract an audience when you mostly blog about yourself, unless you happen to be a celebrity (but if you are, attracting a following should be easy). Sure, once you get fans, they might want to learn more about you. Occasionally blogging about yourself reveals your personality and shows that your human. But this won’t attract an audience. Posting about things that don’t relate to your book might get attention if they’re fascinating topics. However, most of the people who check these things out won’t be in your target audience. Plus, if they’re popular topics, there are many other popular resources writing about them online. I like to see snippets of things you’ve done as part of your writing process. 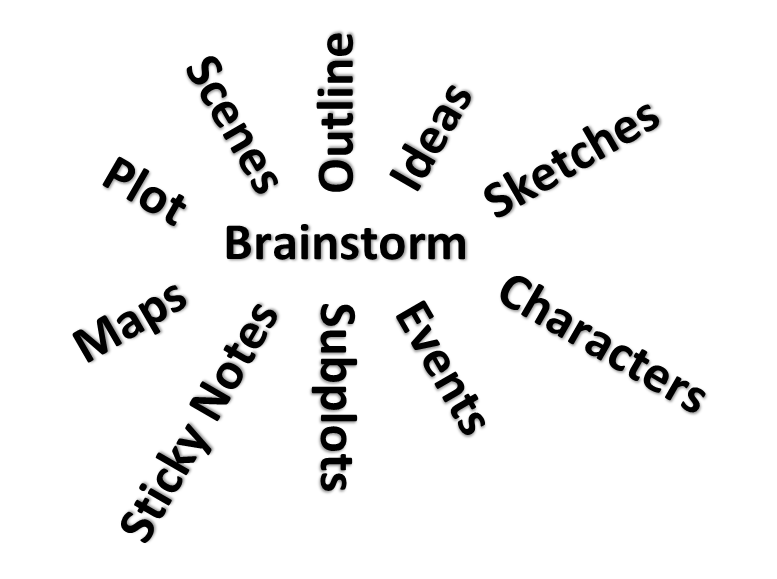 Show me a scratch sheet with a word cloud, a photo of sticky notes with ideas for your book, sketches of characters, a preliminary map for your fantasy novel, etc. These kinds of things show the effort that you’ve put into your work. It’s kind of cool; something more than just a book. I like to see this whether I’m just discovering your blog or if I’m already a fan. It gets me interested in your writing. Short poems don’t require me to invest too much time in an unknown (to me) writer. If I like the way you combine words together and express ideas in short poems, this gets me interested in your writing. I’ve discovered a few different authors this way. There is a lot of poetry out there, though. Your poem won’t appeal to everyone, won’t be discovered by everyone, and has to be pretty good to stand out with so many good poets here. No matter what, though, it helps you achieve variety with your blogging and provides a short writing sample to prospective readers. Occasional posts to show what’s going on with your book catch my attention. Cover reveals, blurb posts, debut announcements, rare promotions, rank achievements, and so on give you an opportunity to mention your book without solely saying, “Buy my book.” I enjoy seeing highly marketable covers; they grab my interest. You’re not likely to attract and hold an audience by constantly blogging about your book. But mixing such updates about your book in with many other kinds of posts rounds you out as a complete author. Support for other authors shows me that you’re not focused solely on yourself. I don’t mean that if you reblog Author X’s post, then Author X will be interested in your book. I mean authors in the community recognize other authors who are interactive, supportive bloggers in the community, and we all tend to support one another in various helpful ways. Your experience as a writer and writing ideas attract my interest. I like to discover concepts that I’d never thought about. For example, I’ve read many fantasy novels, but never realized how many challenges fantasy writers face until I discovered a variety of blog posts describing them. Such posts also show me that you’re an experienced author who has spent much time contemplating complex writing problems in your genre. A weekly goal post shows me that you’re organized. It looks professional. It should be a minor thing among other kinds of posts, but it’s nice to see your objectives and progress. Follow me at WordPress, like my author page on Facebook, or connect with me through Twitter. It really is hard to connect when working with fiction. Historical fiction and romance have it easier than others though. I think they have a firmer hold in reality, so people can relate more to those. I write about my thoughts on my overall genre and the traditions, which goes over well. Humor is always a powerful tool. That’s a good point about historical fiction. There are a lot of novels in mystery, suspense, and action, for example, that have content of some sort (like a sport or a place, for example) that can help to attract interest. I suppose fantasy can still attract interest in specific creatures. Usage of mythologies definitely helps. I think fantasy depends a lot more on suspension of disbelief and a desire to escape reality than the other genres. Even science fiction can hold a better grasp of the real world than fantasy. It’s interesting to me that fantasy is still kind of fringe, but being inside the genre, you feel like it’s one of the mainstreams. A very deceptive genre in some ways. I really like this post a lot. I think I’ll probably start doing this, because I really do need to continually grow my blog. I noticed the posts that attract attention the most on my blog contain some of the content you mentioned above. I just need to get on to a regular blogging schedule–well, really, I need to re-organize my life in general! It is funny that Charles says that. I think fantasy writers, and those who delve into magical places of mythical creatures have it easier. You create your own world. The grass is always greener 🙂 Reality poses it own problems. People are quick to judge reality. Reading crime dramas, my husband is always quick to point out what doesn’t quite fit. The most critical Facebook groups I have been in are the historical fiction ones. Read some of the nasty reviews on historical fiction books to see what I mean. Romance is what it is, and there are so many, and there are also so many tastes as to what constitutes good romance. Reality can be a tough sell. “You should have some variety. People have varied interests.” That note rings true. If you put me in a stadium filled with people, I’d be hard pressed to pick out the ones who enjoy historical fiction, or fantasy, romance, or any genre really. It would be interesting to play “pin-the-genre-on-the-reader.” That could be a fun game. Impossible. My little old white haired Grandma liked reading about black magic and evil sorcerers. You always have such good tips Chris, and now if I can just find the time to put them all into action! My file is growing steadily with ‘things I want and need to do. ‘Sometimes it seems like a second job to get all this ‘marketing’ in place. Can you tell I’m a little overwhelmed right now? It must be the holidays. A Very Merry Christmas to you and your family back in my home state! I personally like (and implement) Kristen Lamb’s ideas on the author blog. She says that people are more likely to care about your book (especially an unreleased one) if they feel like they know you, so put yourself out there! It’s especially hard when you don’t have a book out yet, but you’re trying to build a platform. I know I feel silly doing “how to” or advice posts on writing, because why should people listen to me? Plus, every other aspiring author out there has a “this is my journey as a writer and here’s how to do it and this is my book” blog. I’m not saying that’s a bad thing, but I definitely prefer reading the ones that give me insight into the author as a person who I can connect to instead of it being all about the book. I do post snippets, goals and progress reports, and yes, the odd preview and short story (hey, I did that today! ), but I like to mix it up and try to entertain people along the way. Starting your blog months before you publish is an excellent idea. Mixing it up in some ways can be good, too. Making friends, that’s the way to go. 🙂 Good luck with your book. There’s nothing more rewarding than stumbling upon a great fiction blog. But they’re also super hard to find – you have to wade through a lot that don’t speak to you. So I really like your point about having short snippets that readers can check out to get a flavor of your writing before they invest. As always, engaging and thought provoking, Chris. I’m sure you do. Keep up the good work! Some really interesting points here, Chris. A great post. I always find your posts interesting and informative, Chris. You provide a wealth of useful knowledge.